If you are marketing your goods and services on Twitter you can add a TwitterCounter button to your blog or website. When visitors to your site click it, they are taken to your TwitterCounter homepage. By adding a TwitterCounter button, you show in your blog (your central online content hub) how many people follow you on Twitter. Click the My Buttons tab at the top of the TwitterCounter page. The button is located above your TwitterCounter stats details. When you click the button, a new page loads, displaying different buttons and widgets that you can embed on your website, blog, or social network profile page (outside of Twitter). Edit the Twitter username, text color, and background color of the button. Click the green Generate Preview & Code button. The preview of your button and the source code appears on the right side of the screen. Copy the script or code, and post or embed the code into your desired social network. TwitterCounter offers a ton of great resources for tracking, updating, and comparing your Twitter account with the overall database. It also offers ways to gain more followers using the tool in different ways. 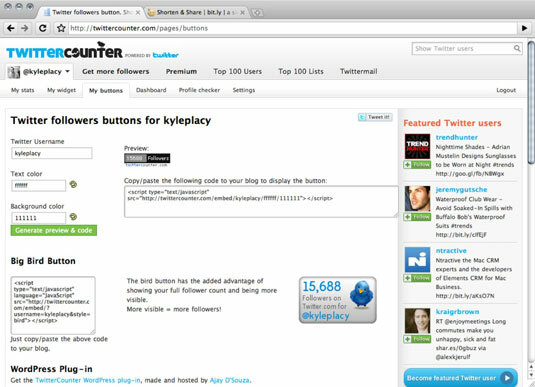 Become a featured user: TwitterCounter offers a service to help advertise your Twitter account to the users of the TwitterCounter site. The premium service (or ad placement) is a great way to gain followers. For different pricing structures (monthly or one-time accounts), you can be given from 15,000 views to 5,000,000 views. Compare accounts and follow back: Compare different accounts that may be competitors to your Twitter account and follow their featured users. This is a great competitive advantage when it comes to measuring influence on the Twitter site. Use the Ranking function to follow influencers: The site includes a list of the top 100 twitterers and the top 100 lists as well as global ranks of Twitter users. Follow the influencers and use options in this book to get them to talk about your Twitter account! Predict follow size: TwitterCounter also gives you predictions on the different sizes of your followers based on your past growth. This can be used to track size and rank over the course of a certain time period. TwitterCounter may be a better tracking system then a follower growth system, but the tools can be used to grow your Twitter account. With growth comes traffic, and with traffic comes increase in sales.